What can PR learn from living with Alexa? Quite a bit it turns out. We bought our first Amazon Echo just under a month ago and since then I’ve been having fun figuring out how we can use it for the family and thinking about the potential uses of voice interfaces for public relations and corporate communications. Amazon Echo is a voice activated speaker powered by ‘Alexa’ Amazon’s automated digital assistant which competes with Microsoft’s Cortana, Apple’s Siri and Google’s less than imaginatively titled Google Now. I’ve held off buying either an Echo or a Google Home because I’m a big fan of Microsoft Cortana and was unsure about the logic of using two different digital assistants. However, my decision to choose Amazon paid off in a big way just three days later when Microsoft and Amazon announced a partnership to use Cortana on Alexa and vice-versa. It’s not perfect integration as you’ll still have to open the other assistant within the one that you’re using, but it’s still a big step forward and a very smart move in the ultra-competitive artificial intelligence and digital assistant world. Unfortunately, I can’t imagine either Google or Apple being this smart. For our first digital assistant I chose the Echo which is a tall tube about 23cm high and 8cm wide and currently costs £99.99 on Amazon with a £50 discount, which I’m guessing will be permanent. There is also the cheaper Amazon Dot, which is a much smaller and cheaper speaker about the size of a paperweight and costs £49.99. It’s very easy to set-up as you just plug it to the mains and a blue ring of light appears at the top, which after about a minute turns orange and then it’s ready to connect to your Wi-Fi. While it was doing its thing I download the Alexa app from the Google Play store. I had to change a setting to turn off smart Wi-Fi on my mobile, but the app helpfully prompted me to do that. Then it was simply a case of choosing the right Wi-Fi network and typing the password into the app. You can choose to save the Wi-Fi network within Alexa to make setting up future devices even easier. Then you’re ready to start chatting by saying the ‘wake’ word. By default this is Alexa, but in the app you can change this to Amazon, Echo or my favourite Computer and then in best Patrick Stewart fashion you’re able to say “Tea, Earl Grey, hot”. The voice recognition is fantastic and it was able to understand all three of us straight away, without any need for training. It works even when there is a lot of background noise like a running tap in the kitchen, while the TV is also on. You don’t need to be close to it as it can hear you from the other end of the room. In fact that might be one of its drawbacks as if you’re standing between two devices both might spring into action, with neither working. You know that the Echo is listening as you see the blue ring of light at the top. There’s also a button on top if you want to switch off the microphone to stop it listening. Perfect for privacy freaks, but if you’re a privacy freak you probably wouldn’t have one anyway. There’s lots you can do straight away such as “Play music from the 80s” or “Listen to BBC Radio 4”. By default it uses Amazon Music and TuneIn, but you can also connect it to Spotify. If you’ve got Amazon Prime it can already play millions of songs, but if you ask for one that’s not available it will prompt you to subscribe to Amazon Music Unlimited. I haven’t and won’t. It comes ready to say “Play my Flash Briefing”, but that’s better when you customise it with your own flash briefing content, which you can choose from hundreds of sources including mainstream ones like the BBC, The Guardian, Sky News and the Met Office (choose your region). The hundreds of other sources include fun things like word or quote of the day to specialist news sources. This is where my first immediate PR idea comes as you can publish your own flash briefing. It can also answer a variety of questions such as “What is the capital of South Africa?” – a trick question as there are three, which it gets correct. Or you can ask it the old favourite “What is the meaning of life?”. It can also cope with questions about finding local businesses and restaurants, going to the cinema and telling you about local travel information. It has a selection of games including ‘Would you rather’ and ‘True or false’. You can also add items to a shopping list, which surprisingly is one of the most useful features as when you’re in the heat of cooking and have raw meat on your hands it’s impossible to add things to a paper shopping list (or our previous one in Microsoft OneNote). Now you can just quickly add things as you think of them and you’ll see them in the Alexa app when you get to the supermarket. Once you’ve linked your diary it can tell you what you’ve got coming up or let you add events to your diary. It supports Microsoft (Outlook.com and Office 365), Apple (iCloud) and Google (Gmail and G Suite). I’m not sure if Google Home supports other diaries or just its own. While you can add events and ask it what is coming up, you can’t edit or delete events. The diary should be one of Alexa’s best features, but unfortunately, as I explain later, it has been so badly implemented as to be almost useless. Uber – Or rather I’d like to use this one, but unfortunately it doesn’t work for us as there is rarely an Uber near the house as we live on the boundary between Leeds and Wakefield and not many Ubers come near local authority boundaries. The Magic Door – an interactive story where you enter a world and decide which way to go to decide your own fate. find out which Hogwarts house you belong in. Beat the Intro – a fun daily game with the intros to three pop songs for you to identify. It’s hard. Blackadder – and a fun one for grown-ups as it plays Blackadder sound clips. The BBC has just announced it is producing interactive radio plays for Alexa. This is where my third PR idea comes in as there is lots of potential for creating your own interactive stories. I’ve also bought a multi-coloured smart light (£15) and a couple of smart plugs (£14 each). This is where you can see it’s still the early days of digital assistants and voice control as setting them up is a multi-stage process. You’ve got to install an app on your phone – or two in my case as the light and the plugs were from different manufacturers. You’ve then got to activate both the skills in the Alexa app. However, once you’ve gone through the unnecessarily convoluted set-up you can control different things around your home . You can set-up the name of your lights and plugs so you can give instructions to each one based on what they really are or do such as “Living room tripod on”, “Change living room tripod to blue” or “Garden office heater on”. Other skills I’ve spotted that look good include TED Talks, Guard Dog (leave a pretend dog to guard your house while you’re out, we have a real one so I haven’t tried this in case they fight!) and lots of skills for recipes, travel, news, education, finance, health and fitness etc. After just one day we decided that we liked Alexa enough to buy another two devices so we got an Echo for the garden office and a Dot for the living room. How can PR use Alexa? You can create your own Flash Briefing with interesting news or updates. But remember the best content isn’t you talking about you so make the briefing about something interesting like your industry or sector with just one (or even no) mention of you. Examples of this include the ‘University of Sussex Flash Briefing’ and the ‘Cancer Research UK Science Blog’. Browse the library of 15,000 skills to see if you see any that will inspire you to create new skills that will help your organisation. How about a Q&A about working at your company with the ability to start filling in an application form that can be finalised on a mobile or computer? There are already some interesting interactive stories available. You could script and create compelling stories or create role-playing scenarios. How about a role play with a series of ethical dilemmas for people to work out? And truth be told, although it’s great there are lots of problems. The first and by far the biggest is Alexa isn’t very family friendly. It’s a major problem for a device that is designed to sit in kitchens and living rooms. By default you set up each device linked to one Amazon account and can then set up ‘Households’ to link another Amazon account. But its so badly implemented for something that’s meant to be part of your house. It all feels a bit selfish. For example if I ask Alexa to “Play Big Country” it responds “I can’t find songs by Big Country” which is a bit odd as it was happy to play them in the kitchen the other day. 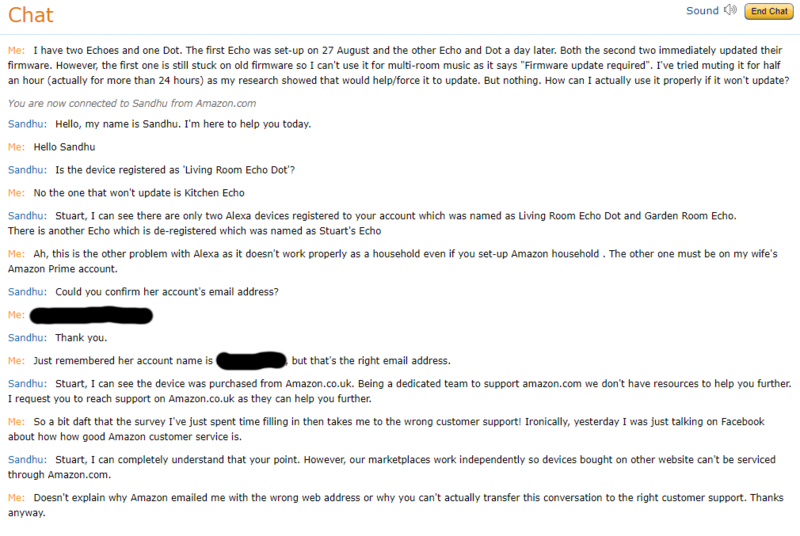 Turns out it’s because the Kitchen Echo was in Karen’s account and the garden room Echo was in my account. Our household Prime subscription is in Karen’s name so nothing works in mine, despite the fact that Prime household is enabled so I can use my Amazon account to get free deliveries via Karen’s account I can’t use it to listen to music. The About Amazon Households page doesn’t even mention music on either its available or unavailable lists. Stupid that it doesn’t work for Alexa. Another problem is even with separate accounts set-up it doesn’t distinguish between different people’s tasks lists and diaries. So you can’t just say “Add visit Dad next Friday to Karen’s diary” as it just dumps it in the first diary that was added. What it appears to do is to put the event into whoever the device is registered to. It basically makes what should be one of Alexa’s best features, pretty near useless. Similarly any task you add is just dumped into a single task list which also makes it useless. I can understand why this functionality is good on the shopping list, but it’s just stupid on a to-do list and indicates how the developers haven’t really thought about real-life use. The other problem is that the to-do list is quite siloed as it only links to three other task management systems – Any.do, Todoist and AnyList. Thankfully, I have figured out how to partially solve this problem by linking the Alexa to-do list to Todoist and then using Microsoft Flow to create a new Outlook task from a new Todoist task. Unfortunately, this is one way so if you mark the task complete in Outlook or To-Do it’s still languishing in your Alexa and Todoist list. This means you’ve got to mark it complete in Alexa or Todoist as well. Still that’s better than not remembering to do the task at all because it’s on the orphaned Alexa task list. But it shows how far AI voice systems are from being even vaguely intelligent. The third problem is that I bought a Dot for the living room thinking I didn’t need a good speaker as I could connect it to the TV sound bar by either audio cable or Bluetooth. Well you can by either, but it’s too dumb to know it should use its own speaker if it can hear sound from the TV. This means in order to hear what Alexa says you’ve got to manually switch the sound bar between audio sources. Once again an example of developers not really thinking through how people will use it in real life. If I hadn’t recycled the packaging I’d have returned the Dot and replaced it with an Echo as despite it being £50 more at least it works. So the Echo was great, but I’ve been ripped off with the Dot as common sense dictates you’re not going to buy a speaker just for the Dot, but you have to as you can’t use a speaker easily with both a Dot and something else. A fourth problem is that multiple devices don’t really play well together. For example while shopping lists and task lists synchronise between different devices, so you an add items from anywhere, reminders and alarms don’t. So if you set a reminder on the Kitchen Echo to “Take the curry off the cooker” it will quite happily let it boil dry if you go back into the office to do some work as the Garden Office Echo won’t remind you. A fifth problem is there is no way to force a device to upgrade its firmware. We have three devices, the second two we bought (just one day after the first) automatically upgraded about a minute after I’d connected them to Wi-Fi. The first one we bought is still on old firmware. A quick Bing search told me all you had to do was mute the device for half an hour and it would update. Well I’ve had it muted for more than 24 hours and nearly a month later it still hasn’t updated. This means we can’t use the new ‘Audio Groups’ function for multi-room music as one says “Firmware update required”. That’s good I thought I can click on the chat and Amazon’s usual excellent customer service will help me to update the firmware on my Echo. It didn’t go to well as you can see from the chat transcript below. What I didn’t realise when I was in the conversation is that I actually had clicked on a link to UK support, but ended up on US support. However, when I actually examined the URL behind that link it was to Amazon.com. Not good. The ‘By phone’ link is also wrong. Incidentally, while I was doing the first draft of this article an interesting post popped up in my RSS feeds from Stephen Waddington. Coincidentally he’s been experimenting with Google Home and has shared his experiences in ‘Okay Google, I think we’re going to get along”. So you can read Stephen’s review to help compare the two. The one area where Alexa is a long way ahead is the number of things you can do with it, simply because developers have had so much longer to create skills and there are so many more Alexa devices in use. One thing I’m interested to know about Google Home is that because you have to train it to recognise six people does it actually work properly as a family device and therefore can you easily add appointments and tasks to the right diary, play music from any account etc. Let me know in the comments if you’ve got ideas for how we can use Alexa, and other voice controlled devices, in public relations or corporate communications, or maybe if you’re already using them let me know what you’re doing and you can do a guest post on the blog.